As I have done for my past three iPhones, I've put together a video that shows how well the iPhone 5 works with various wired and wireless microphones. You can watch the video below, and you can read through my comprehensive day-one review of the iPhone 5 in the Reviews section. Under the video below, I've listed all the microphones and adapters I used in the video, with links to Amazon for each. (See my full article on iPhone and iPad microphones and audio inputs here). Shure PG48 (like SM58) with VeriCorder XLR mic-level adapter. Audio Technica Pro 88 W/T Wireless Lavaliere microphone with KVConnection line-level adapter. Shure PG48 with Tascam iXZ (see my review of the Tascam iXZ). Cheap Panasonic Headset with cheap TRRS 2.5mm to 3.5mm adapter. Audio Technica ATR-3350 with KVConnection 1/8" iPhone mic adapter. Pyle-Pro PDWM96 Wireless Lavaliere microphone with Shure FP12 headset adapter. If you have any questions, please leave a comment on the video page or in the comments below! I have the Audio Technica Pro-88W connected to a kV Connection KM-IPHONE-MIC, which is connected to an iPhone 5. When I connect to the Pro-88's Mike Out jack, the volume is very low. I can normalize the audio in iMove and it sounds ok, but a bit noisy. When I connect to the Phone Out on the Pro-88 it clips very badly. Should I get the KM-IPHONE-MIC42-A22 adapter, which appears to be the same as the one I have, but with an attenuator so I can plug into the Phone Out jack, or is using my current cable with the Mike Out jack the best I will do? Which adapter cable are you using? I would use the line-level adapter from KVConnection with the phone out jack on the 88W. That's what I used in my review video above, and that's also what I use in my (unpublished as of this writing) Review of the Audio Technica Pro-88W. The mic adapter from KVConnection requires a pretty strong mic signal—more than what most cheap lavs and mic-level outputs on made-for-video mics will put out. Ok, thanks. I've ordered the line-level adapter. It's too bad that the Pro-88 doesn't have any ability to adjust either the line or mike outputs. I suppose that's a fallout of its low cost. Seems to perform pretty well otherwise, though. I got it so my wife can do yoga podcasts. Pretty invisible on-camera, comfortable and performs well enough for voice. Great video. I'm looking at recording a baseball coach give instruction from a few feet away while I record it with my iPhone 5. I'd like to use option 3 Audio Technica Pro 88 W/T Wireless Lavaliere microphone with KVConnection line-level adapter.. Is there any other item needed to make this work? I've seen in the past where the wireless mic would plug into some type of receiver which would then go to a mixer etc... I'm looking to keep it as simple as possible. Thanks so much. Great site. No, you'd just need the lavaliere (which comes with a transmitter you wear, and a receiver you plug into the iPhone through the KVConnection adapter), and your iPhone 5. This is my preferred setup nowadays, as it gives me freedom of movement and a good sound level. Thanks for the review of the above microphones. I'm having the same trouble as the other comment - low record volume when using the iphone 5. It's evident in your videos above - too - the recorded volume is extremely low. I have to turn the volume to full on my 2011 Macbook Air & youtube volume to be able to hear you. We've made many videos for our business with an iphone 4S - the volume was loud and clear. Now - with the iphone 5 - no matter what gear I use - my record volumes are extremely low. Through my testing - it's obvious - it's the iphone 5. What's your opinion? Since you've made the videos above - have you begun to notice the low volume? Have you recorded with an iPhone 4S for comparison? Thanks for you help. I'll post again if I find a solution. It seems the iPhone 5 does require a little bit more level for a good volume; I've had the best luck with the VeriCorder cable and an SM58, with the GuitarJack, and with line-level outputs rather than the ATR-3350 mic and a mic-level output. 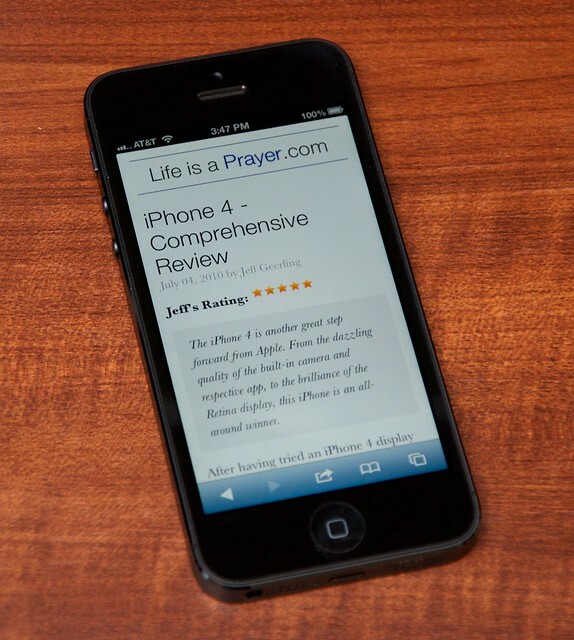 I think I'll need to update my article here with revised evaluations for the iPhone 5. I've solved it!! It has to do with the adaptor from KVConnection. I purchased a Radio Shack adaptor (#274 374) that does the same thing. When I switched to the Radio Shack adaptor the volume was loud and clear - like it had been with the video shot on an iPhone 4- 4S. I wonder if it has to do with the length of the KVConnection adaptor - they're about 10" long. The adaptor from Radio Shack is a 1 1/2" metal plug sort of thing. KVConnection is a good company - purchased several of their products. They have always been very helpful. I called KV to let them know. Let me know if that helps. Good Luck! Amend my last! Back to "square one." It appears that I was a bit too close to the iphone 5's built in mic. When I thought the Radio Shack adaptor was working - it was the phones mic. The iPhone 5 knocks the audio gain down by 25% when using the latest KVconnection adapter. By accident - I discovered that the iPhone iMovie app allows for the control of audio by double tapping a clip. When I discovered this I noticed the reduction in the gain. After editing my video - I just boosted the audio back to 100% and the audio sounded fine again. Older KVconnection adapters do not work on the iPhone 5 - only the latest one. Azden WMS Pro wireless mic. Sometimes the Audio Technica ATR3350 lapel mic. What a nightmare this has been for us. We were right in the middle of shooting a bunch of video for an upcoming trade show when this audio problem reared it's ugly head. Thanks for posting this helpful info! I had no idea the audio levels required tweaking from the iPhone 4/4S to the 5, but I now know why more than a few people have been emailing me asking about why their KVConnection adapters weren't working as well with their iPhone 5 as their older iPhones. I don't quite understand why I need the adapter for the ATR-3350? It appears to plug directly into the iphone 5. Physically, it will plug in and hold. However, the jack on the iPhone uses a special connector called a TRRS (tip-ring-ring-sleeve) that has four conductors (four metal parts, separated by black insulating bands, if you're looking at a plug). The ATR-3350 uses a TRS (tip-ring-sleeve), with only three conductors. What this means is that the iPhone won't recognize the ATR-3350 as a microphone at all without the proper physical adapter. Also, the mic level coming out of the ATR-3350 needs to be adjusted to work well with the iPhone, and the latest KVConnection cables also help with this. Please find a few questions. Please help me. I am very grateful for your help, insight. Everyday dollar counts, especially for a community news source, ya know! (1). Is this a shoddy product? I know you pay for what you get, but the wire seems to fray (from what I've read in reviews) from the microphone. Has this happened to you. The price point scares me as well. Is this the right instinct? (2). Is the mic cord long enough to do on-camera interviews? For example, I would like to interview people on-camera (me and someone else on camera). This would require someone to hold my iPhone5 or I could put it on a stand. Is the cord on the IK Multimedia iRig Mic long enough for these kind of interviews in any capacity? (3). If I buy this product, will I be able to get it from my mailbox and plug it straight into my iPhone5 and get to work? Do I have to buy something else and spend more money to use this product? (4). Is the IK Multimedia iRig Mic compatible with the latest iMovie app? (6). I have a "microphone block" or "microphone flag" that I would like to feature on the IK Multimedia iRig Microphone for branding purposes. These "microphone flags" are what you see on the TV news casts when someone is interviewing someone in the field. Can I feature this "mic block" on this microphone. It's about 2.5 inches tall. Thank you so much, Jeff!! Any help would mean the world to me. Thank you for taking the time to do this website and post this analysis. You are helping a lot of people. Thanks for the detailed question; I'll try to answer everything as well as I can. 1. It's not a shoddy product, but it's not a 'pro-level' microphone either. If you use the microphone in the field (as I'm assuming you will), I wouldn't expect it to last more than a few months—and that's if you treat it well. The price is too good to be true if you want a microphone that can take a beating. 2. The cord is long enough to have a closeup interview, within 3-4' tops. But not one where people would be both in the frame at the same time. 4. It is compatible with any app that takes normal iPhone audio inputs, including iMovie's latest version. 5. I think it comes with an app that can post audio recordings to some social media outlets, but I always use FiRe, no matter what microphone I use. 6. Most mic flags will work with the iRig mic, but not as well as with a microphone they're better designed for, like a Shure SM58. For your use case, I think I'd recommend the VeriCorder XLR adapter, a Shure SM58, and a 10' or longer XLR microphone cord. It would be a lot more durable, and higher quality setup. Additionally, the mic and cable would work with a variety of other cameras and recorders, and will greatly outlast your iPhone—and maybe even you! Thank you so very much. I truly am grateful. I have spent so much time researching this to no avail (Best Buy, Crutchfield, Apple Store, Amazon, independent websites). You truly are the best resource. I hope you continue educating all of us. I am going to buy all three of your suggestions on Monday. Thanks so much for your posts. I'm a little overloaded with technical information, but I hope I can spell out enough details to explain properly. I am trying to use my iPhone 4 with an external speaker and a microphone. I need to amplify my voice during lectures to graduate students. The lecture rooms do not have any audio system and I have difficulty projecting my voice for extended periods due to a medical condition. I have purchased two adapters so far to convert the TRRS to dual TRS. These are the 1) StarTech.com MUYHSMFF 3.5mm 4-Pin to 2x 3-Pin 3.5mm Headset Splitter Adapter - M/F and the 2) Headset Buddy:(01-PC35-PH35) PC Headset to 3.5mm Smartphone Adapter: Convert Dual 3.5mm to 3.5mm, PC Computer Headset to iPhone, Blackberry, Droid, Pa.
Any suggestions about what I should do now? Do I need to get ANOTHER adapter and just keep trying different adapters until one works by sheer luck? (Why don't the two that I already purchased work?) Or is something wrong with the microphone? The adapters you've mentioned may not work well with your iPhone—in addition to converting the TRRS to TRS, you need to make sure the adapter has the right circuit in it to raise or lower the audio impedance to the iPhone's level. The adapters from KVConnection have this adjustment built-in, which is why I usually recommend them with lavalieres like the ATR-3350. I purchased the KVConnection you suggested, but I could not get any sound out of the mic and external speaker. I have just upgraded to the iPhone5 and still no luck. What app should I be using and what settings? I've sunk about $100 into adapters so far and I have not gotten this to work at all. To summarize, I can get sound to play out of the external speaker with the other adapters I purchased if I use the iPhone's internal mic, but I cannot get any sound out of the external speaker with the KVConnector even when using the iPhone's internal mic. And I can't get any sound out of the ATR-3350 no matter what connections I try. Any suggestions? Which KVConnection cable do you have? It should be a microphone level adapter. And if you want to also have sound through the headphone jack, you need to make sure it's a mic level adapter with a headphone jack on it. The only app I use that has playthrough ability (so you can record sound while you're talking) is FiRe 2 (Field Audio Recorder 2). The only other possibility is that the cable you bought might be bad. It happens rarely, but it does happen. In that case, contact KVConnection support, and they should be able to help. Hi Jeff....I already have a zoom h4n but also have an iPhone 5...it's nice to be able to use the iPhone 5 in tandem with a great video app like Filmic Pro to record my live jazz gigs for the times I don't have my zoom...the problem is, I have an otterbox commuter case on my iphone, so a few of the lightning connector based external microphones out right now may now fit my iphone 5 with a case on it...wondering what you'd recommend for keeping a compact setup but being able to get decent audio combined with the iPhone video? Is the tascam ixz still a decent option? Or is there something better out now? I'm trying not to break the bank but still would like serviceable audio quality...what do u think? Great info! I shared this with my network, too. Hi. Can you recommend a michrophone for I phone 5 or I pad that will record a meeting with about 6 people around a table? Thank you for the thorough information! Your page was the first I found that actually defines what "TRRS" means. Everyone else just states it as if the world already knows. I now know what adapter to purchase. Hi Jeff. I have an iPhone 5 and I want to make some (real) grand piano recordings. Which additional Mike would you recommend (that connects to the iPhone) for the best quality sound recording. Thanks for your help.